The eighth season of extraordinary and diverse performing arts experiences is underway at the Kauffman Center for the Performing Arts in Kansas City. As a major center for music, opera, theater and dance, and the performance home of some of the region’s leading performing arts organizations, the Kauffman Center hosts a wide spectrum of entertainers from around the world. 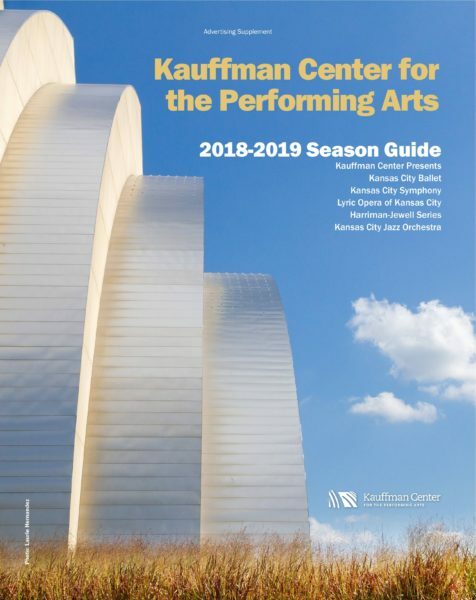 Pick up a copy of the 2018-2019 Season Guide to learn about all the events happening this season at the Kauffman Center. Highlights for this fall include the Lyric Opera of Kansas City’s presentation of West Side Story; a world premiere of The Wizard of Oz from the Kansas City Ballet; classics concerts and special guests like Ben Folds and Leslie Odom Jr. with the Kansas City Symphony; and Kauffman Center Presents concerts with Black Violin and Brian Wilson. Flip through the guide below, or pick up a hard copy at the Kauffman Center or in the September issue of SPACES magazine. Additional performances are added throughout the season. Find complete event listings for all that’s happening at the Kauffman Center at tickets.kauffmancenter.org.